This is one of my favorite chocolate cereals to come out in the last several years. Normally with Kashi cereals, you expect to sacrifice the fun of other cereals in the aisle for the healthier ingredients they promote. That's definitely not the case here. This cereal is tasty, chocolatey and really fun. GOLEAN Chocolate Crunch reminded me of two not-so-healthy cereals from growing up. The puffed whole grains brought to mind the flavor of Super Sugar Crisp while the chocolate coating on the clusters reminded me of Cocoa Pebbles. To make the mixture even more exciting, there's actual little squares of chocolate (about 1/4 the size of dime) in every second or third bite. The cereal starts out very crunchy. After about 5 minutes, some of it softens but there's still some large clusters that remain crunchy until the end of the bowl. And once the cereal is gone, the remaining milk is very chocolatey and delicious. 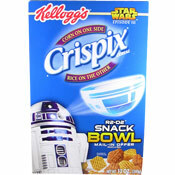 I recommend that you try this cereal. 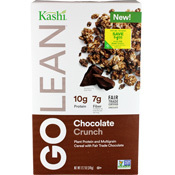 Nutritional Information: Each 3/4 cup serving of Kashi GOLEAN Chocolate Crunch has 220 calories, 7 grams total fat (1.5 grams saturated and 0 grams trans), 0 mg cholesterol, 135 mg sodium, 32 grams total carbs, 7 grams dietary fiber, 10 grams sugar and 10 grams protein. 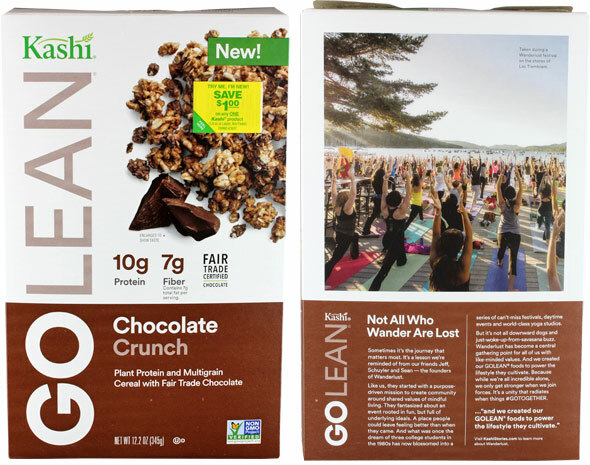 What do you think of GOLEAN Chocolate Crunch?